– easy and cheap hot breakfast | brainsnorts inc.
About ten years ago when I first became a single/divorced dad, I was not in such a position to take my kids out to breakfast on my weekend mornings when I would pick them up. Instead, we’d go to our apartment where I’d make pancakes, waffles, or oatmeal. They would have been happy to settle for Apple Jacks or Lucky Charms, but I wasn’t settling for that. I wanted them to eat a healthier, hot breakfast without costing too much. Even though I can now easily afford to take them out to breakfast every weekend, we debate and split the days. Saturdays we hit the diner, and Sundays find me in the kitchen producing a homemade breakfast for the kids. To answer the obvious question first, yes, it’s okay to use instant/complete pancake mix instead of making it from scratch. There’s not a big difference, and it saves some time. Also, if you recall, this started when I didn’t have the money to take them out for breakfast, so I’m sticking with “tradition.” That’s always a good excuse. The following is not a step by step process, just general suggestions because I assume you’ve made pancakes before. 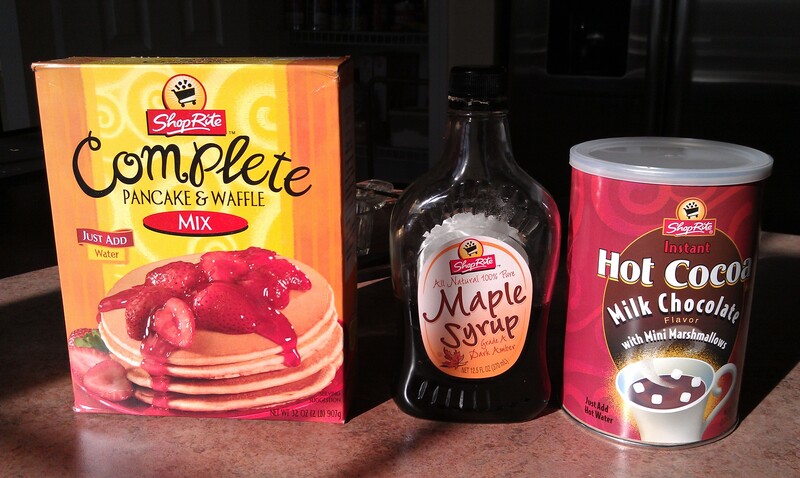 I’m not going to tell you the perfect pancake mix to water ratio. However, I am going to tell you to use milk instead of water. It seems to make the pancakes a little fluffier. Also, in my house, milk will go bad before it’s gone, so it allows me to avoid feeling like food was wasted if it gets used up. Use non-stick spray on the pan instead of butter. You’ll get enough butter later, and nobody needs the extra calories unless you’re undernourished. One of my kids was a bit underweight when she was about 4-years old. The doctor said to put butter on everything, so you already know the drawbacks of too much butter. However, avoid margarine. You’re better off with the extra calories of butter than the chemicals of margarine. Put the milk in the mixing bowl before the pancake mix. Two reasons: first, if you put the mix in first, it’s more likely that some of the powder will get stuck to the bottom of the bowl. Second, you need to put the vanilla into the milk first so it mixes more evenly. I put ½ a teaspoon in the ingredients, but that’s for making only eight pancakes. 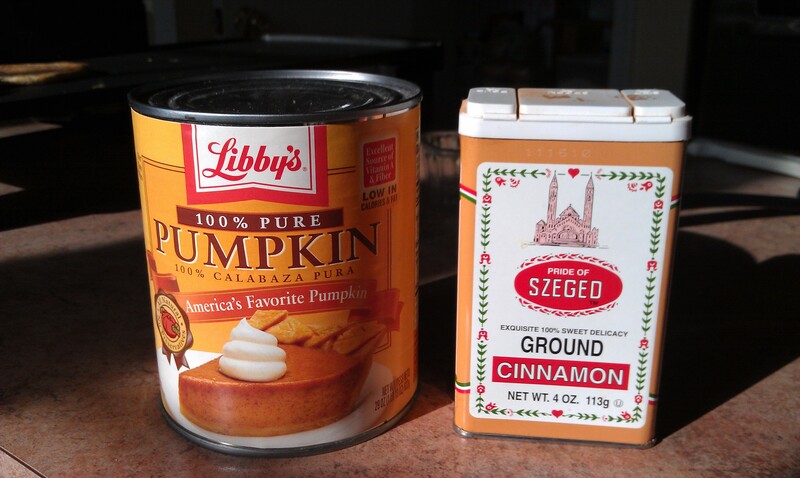 Also be sure to blend in the pumpkin before putting in the pancake mix for the same blending reason. Sprinkle in the ground cinnamon a little at a time as you add the pancake mix. Don’t flip the pancakes until the top side is no longer shiny. 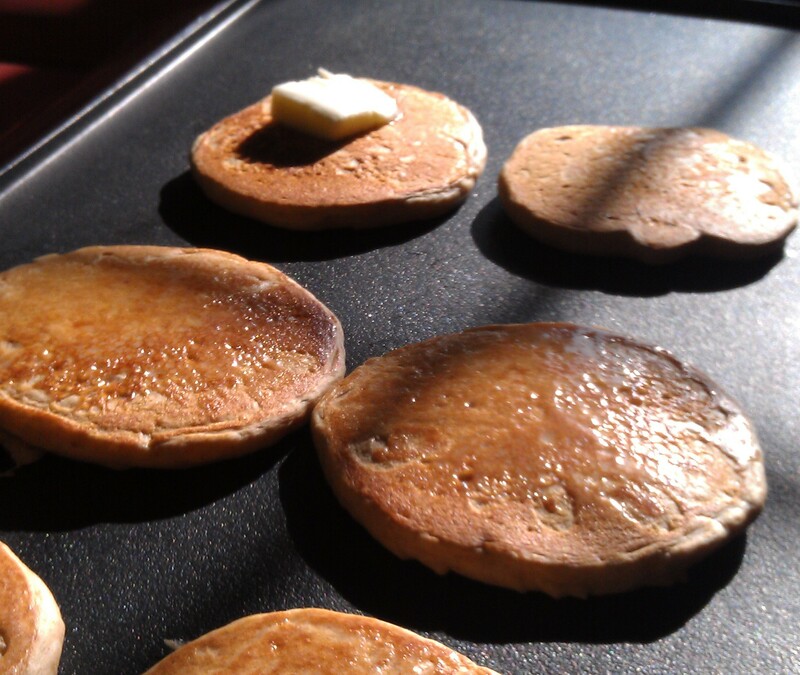 Undercooked pancakes are just as bad as, if not worse than overcooked. Lift a few and peek underneath to see that they’re getting dark brown before flipping them. Once you flip them, put a small square of butter on the already cooked side. It’ll melt nicely into the pancake. Keep an eye on it because they’ll slide off. Also, it’s a lot harder to put butter on pancakes when they’re on your plate or when already sliced. Have you ever tried to put butter on a small triangle of a pancake? Not easy. Real maple syrup costs about twice as much as the imitation, sugar-filled pancake syrup. However, it’s not a very expensive item. Watch the shelves because it’s occasionally on sale for half the price, so stock up when that happens. The flavor is very different and better, and of course it’s healthier. Just be careful because sometimes it pours much more quickly. I use a wide, electric griddle instead of a frying pan on the stove top. It’s easier to clean and you can make eight at a time. It also allows you to stand away from the bacon if it’s sizzling and popping on the stove top. Hot chocolate – however much mix you use, only fill the mug halfway with the hot water. Fill the other half with whole milk. Most kids don’t like hot chocolate when it’s too hot, and the milk adds creaminess and cools it down too. Squirt some whipped cream on top and consider sprinkling a little cinnamon on that too. It looks cool and tastes good. Bacon – get the thick sliced. It holds up better than thin, which gets droopy. I usually screw up the bacon, either over or undercooked, but the thick usually comes out a little better. I haven’t tried microwaving bacon, but it hear it works. I’ve been doing this almost every other weekend for more than ten years. When I give the kids a choice between their favorite restaurant and home cooking, they always choose home. We enjoy the family atmosphere around the kitchen table drinking mugs of hot chocolate and drooling butter and syrup over the pancakes. However, after recent discussions, I’ve learned it’s not all about the home cooking. Turns out at least half of the motivation is that they just want to sleep late and stay in their pajamas on Sunday mornings.